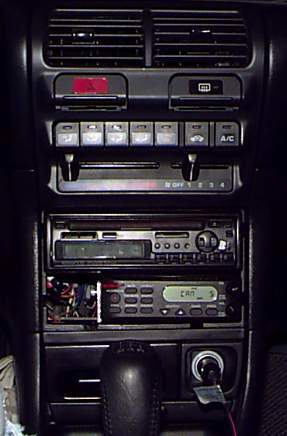 This is the center console with a Kenwood KDC-6005 CD player and Uniden BCT7 Scanner installed. The OEM Acura stereo conforms to the standard DIN size, making replacement with aftermarket stereos a breeze. Before I got the scanner, I simply used the metal sleeve that came with the Kenwood to mount it in the space where the original tape deck was mounted. However, when I removed the plastic "pocket" in order to make room for the scanner, I had to come up with a new way to mount the Kenwood and the scanner together in this space in an attractive fashion. I fabricated special aluminum brackets to support both the CD player and the scanner while allowing fairly easy removal for each. I still need to fabricate a black plastic cover plate to cover the holes. Update: Unfortunately, my Kenwood CD player finally bit the dust. It's seven years old, so I guess that's not too bad a lifetime. The CD doesn't spin up when inserted, so either the main spindle motor is dead, or the motor driver chip is. Update: I haven't updated the photo yet, but I now have a Kenwood KDC-MP8017 CD/MP3 player. It was only about $170 on eBay. It should do nicely until I build my next really big project, the "carputer": a miniature computer with a touchscreen that plays MP3s and does GPS navigation. That's probably not going to be for quite a while though. In the quest to avoid being caught for speed violations, I saw two routes: radar detectors and police scanners. While radar detectors are illegal in Virginia and Washington D.C., mobile scanners are not. 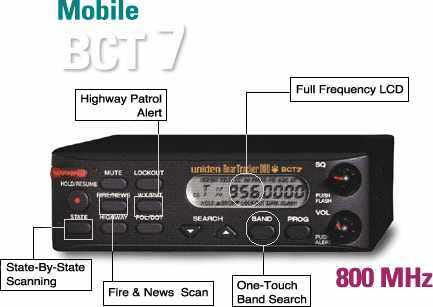 The Uniden Bearcat police scanner detects activity on highway patrol bands and sounds an alarm when a highway patrol transmitter is detected within three miles. The signals these units detect come from the mobile repeaters that most highway patrol cruisers have in their trunks in order to extend their radio range. The Bearcat scanners detect these repeaters and alert you if they are within an approximate three-mile radius, according to Uniden. I've had my scanner for several years, and I've found that it has two problems. The first is that it's so unreliable. If you're trying to detect a cop in a speed trap, you have a certain window of opportunity when you get within about 3 miles of him. He needs to receive a broadcast on his radio within that time for the Bearcat to detect it. As you can imagine, police radio broadcasts can be pretty sporadic, especially in rural areas where not much happens. Radar can also be used sporadically by cops (only shooting certain cars), but I think that's generally more reliable than radio transmissions. The second problem is false alarms. When I was driving around Virginia, I got all kinds of false alarms, I think mostly from police cars on nearby roads. There were so many times I slowed down for cops that just weren't there. Radar detectors won't do this due to radar's directionality. If a radar detector beeps, you know there's radar being used on the road ahead of you. If you have the space and don't mind spending the money, it might be worth it to you to have the scanner as a back-up for a radar detector on the highway, but for the reasons above I'd really prefer a radar detector if I was worried about being caught for speeding. Definitely don't really on this scanner by itself, and don't bother using it in town. Aside from detecting highway patrol cars, this scanner has many other cool uses. It's pre-programmed for the frequencies normally used in each state, so you can tell it which state you're currently in and it'll scan for police transmissions. Due to police departments' use of long-range radios and repeaters, I've heard police transmissions about events over 100 miles away. It can also receive weather, fire, and news broadcasts, and is programmable for any other frequencies you find. I've programmed mine for the frequencies used by the local drive-thru restaurants, and can actually hear the employees clearly for a change. It's also amusing sometimes to listen to other people place orders at restaurants. You can also listen to cordless phone transmissions, amateur radio, and just about anything else within reason, except cellular phones or digital transmissions. If you're looking for a compact, fully-functional scanner to listen in on all sorts of analog transmissions, and not a complete replacement for a radar detector, this unit is an excellent choice. It even has a backlit display so you can see it at night. Using some adaptors from Radio Shack, I connected the scanner to the car's AM/FM antenna so I don't need a separate antenna. Update: I just wasn't using this radio very much, so I finally took it out. If you're interested in buying it, it's for sale for $50. 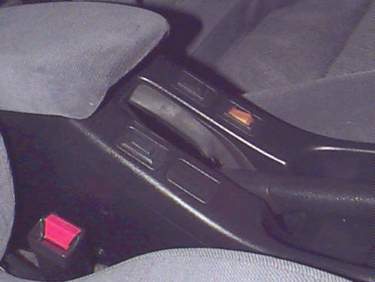 Here are some extra switches I have installed next to the handbrake. 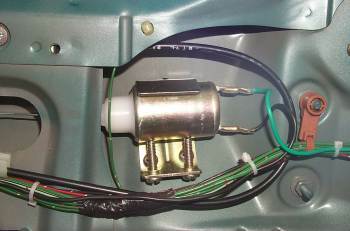 The one on the passenger's side is a momentary rocker switch connected to a garage door opener circuit board inside the housing. The black switch on the driver's side is a power antenna override switch to lower the antenna whenever I'm listening to a CD (99.44% of the time). The amber switch just below it is an illuminated rocker switch for the foglights. Because the light was too bright at night, I installed a small resistor on the switch to reduce its brightness. I purchased this Omega keyless entry system for $30 on Ebay. Since everyone else these days has one, I guess I should have one too. Luckily, this one was much cheaper than the OEM system which retails for around $300. 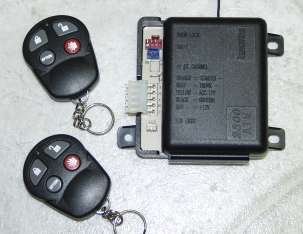 It has a four-button transmitter, with lock, unlock, option, and panic buttons. The option and panic buttons can be wired to anything you wish, and the system has many programmable settings controlling when it locks and unlocks the doors (like relocking the doors 30 seconds after they've been remotely unlocked). Since it's an aftermarket system, I can potentially do more creative things with it than with a factory system. In case you're wondering, I didn't buy a full-blown alarm system because I think they're totally useless at preventing theft (unless it's a Lojack). Do you ever pay attention when someone's alarm goes off, or do you just think, "another false alarm"? After finding how convenient the keyless entry system for unlocking the doors without fumbling for the keys and risking scratching the paint on the door, I realized I wanted the same functionality for my rear hatch since I use it fairly often for storing cargo. '98-'01 Integra owners don't have this problem since their hatch is locked and unlocked with the doors, but the '94-'97 Integras only have a mechanically-opened hatch. So I bought a trunk release solenoid on Ebay and connected it with a relay to the keyless entry system. It's activated by the "OPTION" button on the remote control. Currently, I'm designing a circuit to turn on the dome light and beep the horn when locking and unlocking the car. Update: Unfortunately the solenoid turned out to be defective and broke--the steel cable actually broke loose of the mechanism inside. I had my doubts when I first received this solenoid; it doesn't really look like a quality-built item. Unfortunately if you shop around you'll notice that this exact model, sold by many different brands, appears to be the only kind commonly available in the aftermarket. Since I wasn't too keen on purchasing a replacement and taking my chances with it being just as bad, I decided to attempt to repair it. The solenoid was pressed together, so I had to use a cutting wheel on my Dremel to cut off the plastic end cap. The cable was originally crimped in a hole in the end of the plunger, but apparently it wasn't crimped tight enough. I reattached the cable to the plunger with a few strong hammer blows. I then used epoxy to glue the end cap back on. 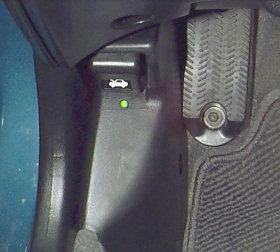 This discretely-mounted green LED shows when my custom ignition kill switch is disarmed.